SWCPoker (formerly named Seals With Clubs) was the first online poker room using exclusively Bitcoin for deposits and withdrawals. This rapidly growing currency has also lead to a rapidly growing poker room. The games here are exceptionally soft, the payouts are often under 12 hours, and the rake is the lowest in the online poker industry. There's currently only a downloadable PC client available, but developers are working on an Android app so that you can play while mobile! Gameplay is completely anonymous, you do not need to provide identification. This is, as SWC describes, the "Wild Wild West of online poker." 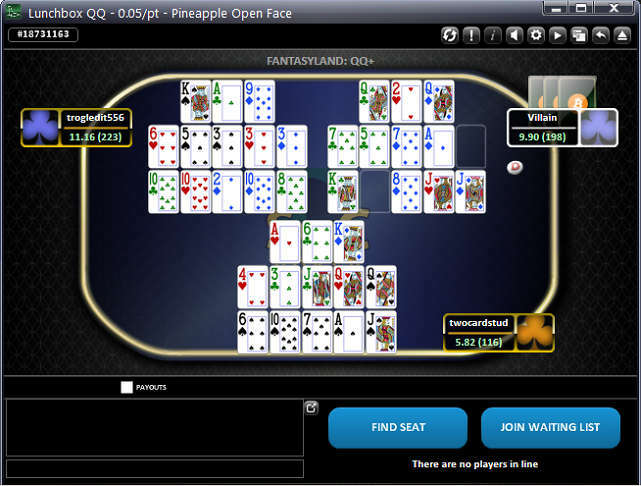 SWC Poker has the most game types available of any online poker site. The games offered include no limit holdem, pot limit Omaha, Omaha 8s or better, PL Big O, PL Big O/8, Open Faced Chinese, Pineapple, Badeucy, Deuce to Seven Triple Draw, and mixed games all the way from HOSE up to 12 game mixed! Unfortunately, there isn't always a game running in the more obscure types, but if you sit down at an empty table, games typically start up relatively quickly. You can also use the chat feature in the software to find other interested players before you even sit down at the tables. Step 2: Click the SWC logo. If you use ad blocking software the SWC Logo may not be visible. Try clicking this direct link instead! Step 3: If you've previously installed the software, you must uninstall it now before continuing. Step 4: Download the appropriate poker client - currently only the PC Client has been released. Step 5: Click the green "Log In" button in the upper right corner of screen. 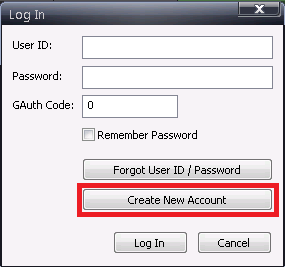 Step 6: Click the "Create new Account" button. 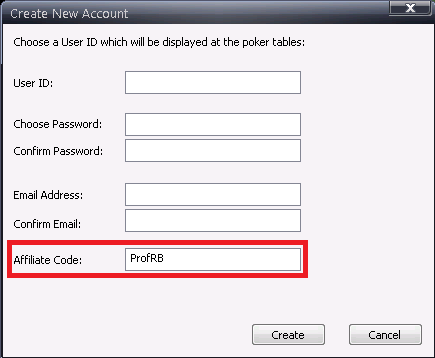 Step 7: Create a new SWC poker account - make sure to input "ProfRB" as the account who referred you. Step 8: Skype or Email us your username and registered email address so that we can confirm your account is properly set up. Also feel free to contact us if you'd like to purchase some bitcoins or SWC chips directly from us! Bitcoins are the currency of SWC Poker. Once you've set up your SWC account, it's time to get yourself some bitcoins. Once you deposit those bitcoins onto SWC, you receive chips that you can use to play in SWC tournaments, sit-n-go's, or cash games. 1 bitcoin is equal to 1,000 SWC chips at all times. The price of bitcoin does not affect the amount of chips received from deposits or withdrawals. Thus if you buy bitcoins at $400 USD per bitcoin and deposit them, you will receive 1,000 SWC chips. If bitcoin prices rise to $500 by the time you cash out your 1000 chips, you will receive 1 bitcoin, which you can then sell for $500 USD on an exchange. We highly recommend reading below and / or using our more thorough step-by-step bitcoin gambling guide with pictures in order to set up your bitcoin holding and trading accounts. A bitcoin wallet basically is an online version of a real wallet and is similar to a bank account, where your bitcoins are stored and can be used to purchase, trade, or sell. ProfRB.com recommends using Coinbase for their easy-to-use software, straightforward approach, and ease in buying bitcoins that can be used to deposit on Seals With Clubs. There are other wallets available with similar features to Coinbase, so you'll have options even if Coinbase in unavailable in your geographic region. However, it seems that most reputable methods will still initially require waiting periods for purchases - more on that below. Step A: Sign up for an account at Coinbase. Once you do, verify your email address, and agree to their Terms of Service. Step B: You will arrive at your Coinbase account page. Click "buy your first Bitcoin" to begin. Step C: Coinbase gives you two options here: "Verify Bank" or "Verify Phone Number." We recommend verifying your bank information for quicker service. Step D: Verify your bank information by linking your bank account and filling in the information required. Step E: You can choose two ways to verify your bank information: "Instant" or "Deposit" verification. Instant verification securely logs into your bank account to confirm your info right then, while deposit verification makes two small deposits and one debit on your account that will appear in 2-3 days. You enter the amounts once you see them hit your bank account to continue. Step F: Once you are verified, you will be able to purchase your first Bitcoin. Now that you are ready to buy some bitcoins, click "buy/sell" on your left-hand links in your Coinbase page. KEEP IN MIND!!! One bitcoin will always net you 1,000 chips on SWC Poker. This never changes: for example, you can purchase 0.5 bitcoins and you will receive 500 chips on SWC. Chips are used to buy into tournaments or sit-n-go's as well as for cash games. Step A: Simply enter the amount of bitcoins you wish to purchase, and your payment method will already appear in the drop down menu. Step B: Once you enter the amount you wish to purchase, Coinbase will automatically list the final cost before continuing on. Coinbase charges a "purchasing fee" of 1% on all transactions - as well, there will be a $0.15 bank fee charged (this amount may vary, but is typically no more than 15 cents). Step C: If you haven't already, Coinbase will instruct you to verify your phone number before completing the purchase. They simply send you a verification code via text that you enter, and this will complete the process. **BEFORE YOU CLICK "BUY BITCOIN" - PLEASE READ THIS CAREFULLY!!! ** For your first purchase of over one (1) bitcoin using Coinbase, it will take approximately one week to process before the bitcoin is in your account. Typically, your bank account will not be charged until two days or so before the processing is complete. Once this process is complete and you have your bitcoin(s) in your account, subsequent transactions will take about an hour to process from start to finish. It's best not to send BTC directly from Coinbase to any online gambling site. Coinbase is a fully regulated entity in the United States, and thus, it must comply with all banking regulations and federal guidelines. Playing online poker from the U.S.A. is a perfectly legitimate endeavor, but it's easy to see how the higher-ups at Coinbase might view it askance and opt to take a conservative route. We strongly advise all our readers to open up an account at blockchain.info. This is a Bitcoin wallet that can serve as an intermediary between Coinbase and your internet poker rooms of choice. By routing all your transactions through blockchain.info, you enhance your security and preserve a relatively high degree of anonymity. After you create your blockchain.info wallet, we recommend that you go to the security section of the dashboard and initiate the backup recovery phrase. This will show you 12 words, which you should write down and keep in a safe place. This phrase will allow you to recreate your wallet in the event that you misplace your login credentials. THERE IS NO OTHER WAY TO RECOVER AN INACCESSIBLE BLOCKCHAIN.INFO ACCOUNT. This is why we view this step as indispensable. Now, click "Receive” toward the top of your web browser, and copy the address. Next, open up your wallet in Coinbase, and click “Send.” Paste the blockchain receive address into Coinbase, and send your transaction when ready. It may take some time for the BTC to actually reach blockchain.info because you'll have to wait for the Bitcoin network to confirm your transaction. Go to the SWC website, sign in, and click "my account". Have your blockchain wallet account open as well. Step A: Under the deposit tab on your SWC account, there will be a "Current Cash-in Address" consisting of a long string of letters and numbers. This is your unique SWC account address that is used to receive your bitcoin deposit. Highlight this and copy it to a notepad file. Step B: On the main page of your blockchain.info account, click "Send." Step C: Copy the long string of letters and numbers in your notepad file. Paste it in the "to" field of the "Send" window that opens on your blockchain page. Step D: Enter the amount of bitcoins you wish to send to your SWC account. Remember, 1 bitcoin = 1,000 chips on SWC, 0.5 bitcoins = 500 chips, 0.25 bitcoins = 250 chips, etc. Step E: Make 100% certain that the cash-in address (long string of letters and numbers) in the blockchain "to" field is exactly as it's listed in your SWC account. Step F: Click "Send Money". The process generally takes 10-60 minutes before the chips appear in your SWC account. You can visit blockchain.info to watch the process of your bitcoin being verified. Simply paste your SWC cash-in address in the "Search" field and hit enter. Typically, once the transaction has been confirmed six times, your chips will appear in your SWC account. Once the chips are in your SWC account, you are ready to play! Is there a Seals With Clubs HUD? -- Try using your favorite search engine and typing in the search term "Free Poker Database HUD" It's the only heads up display that we know of which is functional on SWC. It only works on the Windows version of the poker client. How does Rakeback work at SealsWithClubs? -- SealsWithClubs rakeback is basically a tiered poker VIP program in which those customers who are loyal and play lots of hands, over time, rise to higher tiers and accumulate ever higher rakeback percentages. The cashback starts at 5% and works its way up to 50% rakeback equivalent! There are also ever increasing bitcoin freerolls tournaments that players gain access to as they raise in levels. If you'd like to read more, please check out this link of bitcoin poker rakeback. What is the tournament cancellation policy at SWC Poker? -- Direct from their website it states "If a tournament is interrupted and cannot be completed, management will return buy-ins or award prizes at its discretion."